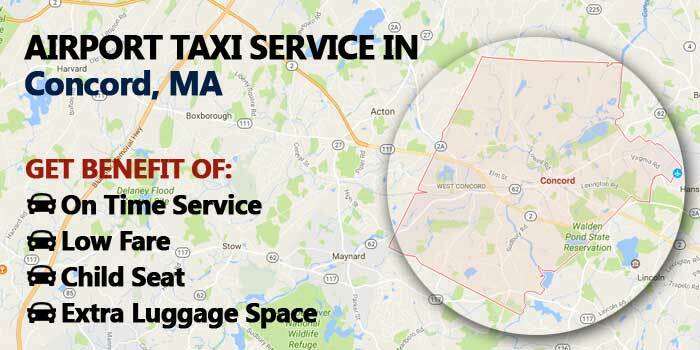 Boston Airport Express offers highly dependable airport taxi and shuttle service from and to Concord Ma to any place in Massachusetts. Our fleet of sedans, minivans and SUVs are great for all travel purposes and needs. Whether you are planning to travel in group or solo trip, you will always find our services comfortable and affordable. You can give us a call or make an online reservation to get immediate confirmation. We also offer stop-over and child seats at a very affordable fee. Concord is an amazing place to visit for both tourism and business purposes as the city has many historic and commercial sites. Concord’s numerous historic sites and buildings offer worthy goals for walks, long drives and adventurous bike rides. There are many amazing shopping complexes in Concord centre and West Concord, as well as a dozen good places to dine. Some of the must visit places in the city include: North Bridge, North Bridge, Orchard House, Walden Pond State Reservation, Sleepy Hollow Cemetery, Concord Museum, The Old Manse, Battle Road Trail, and Ralph Waldo Emerson House. Concord is just 25miles from Boston and the distance can be comfortably covered in half an hour. The city is often visited by tourists who wish to take a break from the busy city life in Boston. Whether you wish to visit the city for tourism purpose or business meetings, we are here to take you around. Boston Airport Express has over 20 years of experience as drivers in the beautiful Boston city. We are one of the most recommended and widely preferred taxi services for all kinds of travel purposes. Book your service today for airport pick and drop facility and city tours.